In Traditional Chinese Medicine the phrase “Tong Qi” refers to ventilation of part or all of the body. 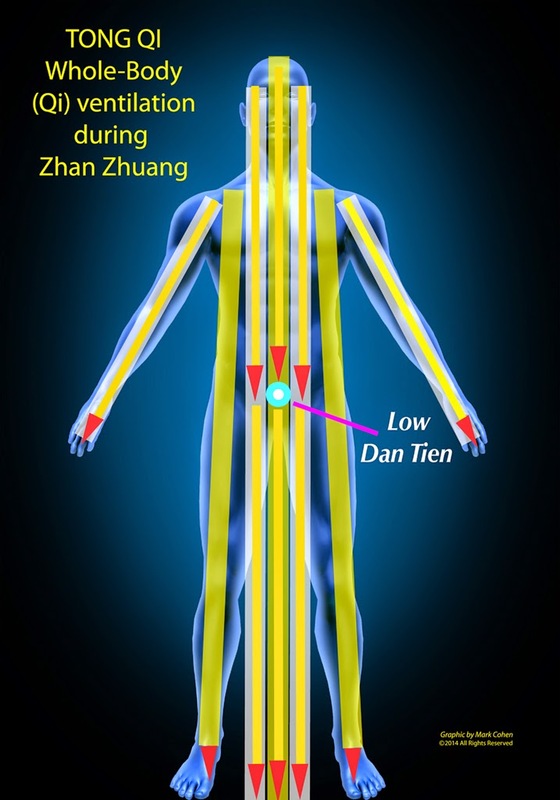 In Zhan Zhuang “Tong Qi” refers to the time when the Qi becomes heavy enough to plunge through the Dan Tien, down through Huiyin point CV-1 and descend through the legs and travel out under the feet, all without the use of any intention on the part of the practitioner. This is a result of the abundance of cultivated Qi “ventilating” the entire body. This being one of the major goals in Zhan Zhuang, it often takes decades of dedicated and correct practice to achieve. But Tong Qi in itself is also a gateway into various forms of what feels like emptiness, as though the body were hollow or transparent or like there are no boundaries between our body and our surroundings, the air or even the ground. Good News! The INSIDE ZHAN ZHUANG Companion DVD - Standing Meditation for Beginners & Seniors is now available on Amazon. At last, a real in-depth look at this simple yet profound form of exercise. The Inside Zhan Zhuang Companion - Standing Meditation for Beginners and Seniors, clearly presents the basics and then delves deeply into the inner workings and techniques necessary to improve health and achieve power. Continued daily practice of Zhan Zhuang - Standing Meditation - has been found to relieve anxiety and depression, help regulate high blood pressure, reduce headaches, improve posture, vitality, memory, focus, circulation, digestion, spinal, back and internal organ problems as well as increase overall strength and balance. It also has the amazing ability to calm the mind and nervous system and support healthful longevity. Also contains a comprehensive Masterpoints Video Reference Guide and an extensive chapter menu for easy reference. Suitable for the novice and seasoned practitioner alike. Excellent for those who don’t have access to a skilled teacher. Good News! Inside Zhan Zhuang Companion DVD Now Available on Amazon. 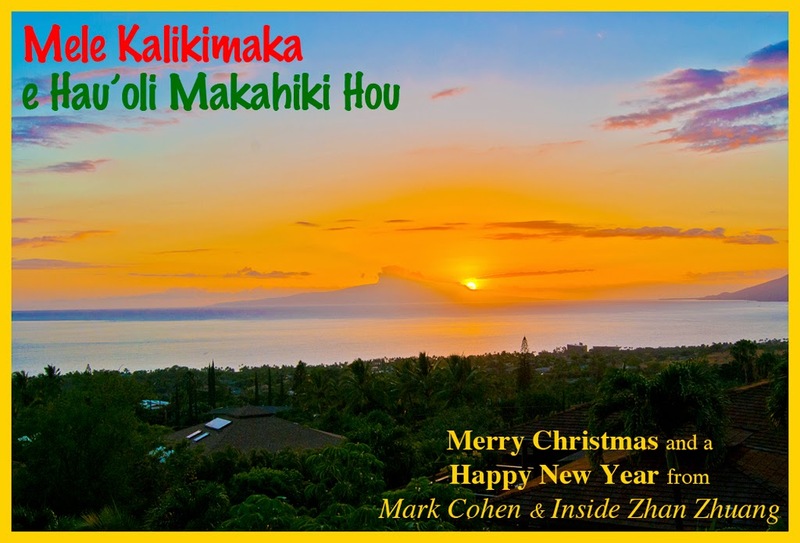 Plus Internal Exercise: "The Mind Leads the Chi"
Aloha from Maui. To everyone around the world who has written me asking for a DVD to accompany the book “Inside Zhan Zhuang,” I am happy to announce that “Inside Zhan Zhuang - Standing Meditation for Beginners & Seniors” is now available at Amazon. The Inside Zhan Zhuang DVD Companion clearly presents the basics and then delves deeply into the inner workings and techniques necessary to improve health and achieve power. It also contains a comprehensive Masterpoints Video Reference Guide and an extensive chapter index for easy reference. Suitable for the novice and seasoned practitioner alike. Excellent for those who don’t have easy access to a skilled teacher. Here’s a simple yet elegant Chi Kung/Nei Kung Exercise that can have profound effects both on one’s health and their ability to move energy. It is my understanding that Wang Xiang Zhai utilized a similar method as part of his training regime. 1) Bring feeling-awareness to Baihui point (GV-20) at the top of the head. Inhale into Baihui point. 2) Just before inhale ends move feeling-awareness to Huiyin point (CV-1) and exhale. 3) Just before exhale ends, move feeling-awareness to Baihui point, inhale and... Repeat process. 1) Bring feeling-awareness to Baihui point. Hold until sensation. 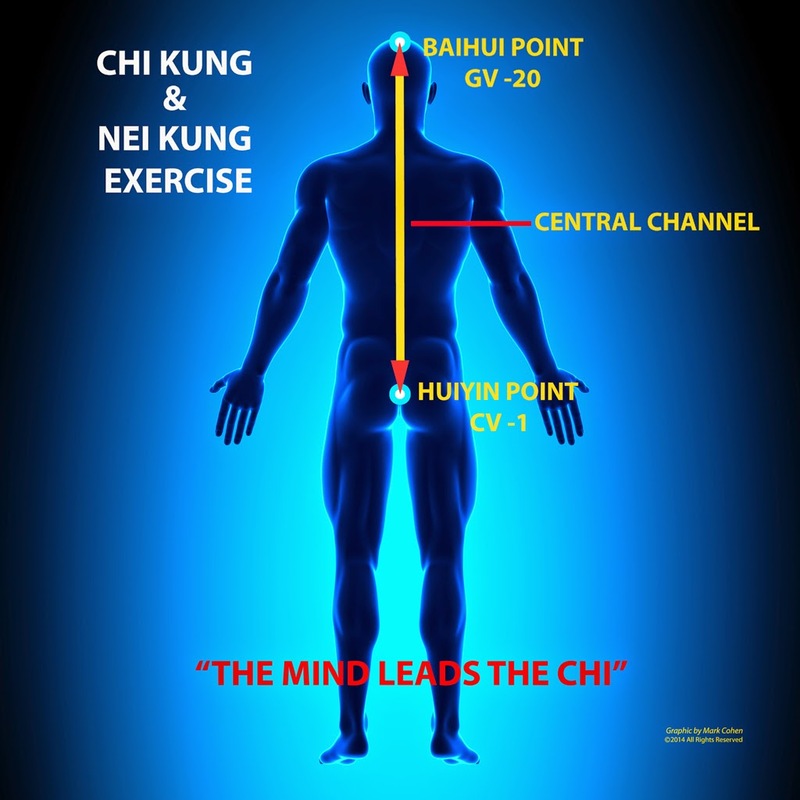 2) Move feeling-awareness to Huiyin point. Hold until sensation.